After the devastating attack on Pearl Harbor on December 7, 1941, which resulted in an entire generation of soldiers, nurses, and other military personnel officially joining World War II-- Hollywood tried their best to pitch in as well. In addition to actors who answered the call of duty and served their country-- major studios such as Warner Brothers and MGM offered up entertainment for the troops with both in-person appearances to boost morale as well as staging elaborate cinematic productions to raise money for the war effort. And now-- more than sixty years later-- there have been so many World War II films crafted (from all different perspectives to offer an abundance of little known points-of-view) that essentially, WWII itself has become its own distinct sub-genre of war pictures. So in an era where we typically screen more than-- and I'm underestimating here-- a dozen brand new World War II movies each and every year, it's intriguing to go back to the original era of the war to check out some of the studio tie-ins. And it's quite a rare treasure to take in this hard-to-find and newly released DVD from the incredible Warner Brothers Archive Collection, Thousands Cheer. Originally, the film was made by MGM as a musical star-studded extravaganza that squeezes in so many marquee names working on the lot that the second half of the film feels like the mother of all “let's put on a show” paradigms especially considering it boasts Mickey Rooney and Judy Garland. 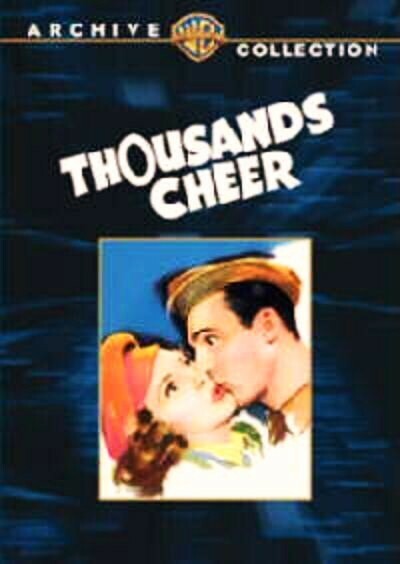 Basically two films in one-- the first hour of the movie directed by former MGM assistant turned Anchors Aweigh, The Harvey Girls, Annie Get Your Gun, Kiss Me Kate, Bye Bye Birdie, Viva Las Vegas, and Pal Joey filmmaker George Sidney uses a cute if predictable romance between Kathryn Grayson and Gene Kelly. Opening with the gorgeous vocals of the trained opera singer Grayson (who began studying the style at age twelve) who performs alongside pianist Jose Iturbi in a stirring number-- we soon learn as her character Kathryn Jones explains to her adoring audience that she's heading with her army colonel father to an undisclosed base to help out with the effort. Having essentially been estranged from her father for most of her life since--much like her mother who finally left--the colonel has always put the military ahead of family, Kathryn jumps at the chance to reconnect with her father and help entertain the troops at the same time. In an amusing meet-cute as Kathryn tries to use a Parent Trap styled bit of trickery to get her parents talking to one another, she finds herself standing alone on the train platform watching amorous lovers embrace and kiss passionately as the soldiers head off. Realizing that she's standing near a single man-- in the form of Gene Kelly's acrobat turned army man Eddy Marsh-- a moment of awkward sexual tension overtakes them and finally building up his nerve, Eddy wordlessly plants a passionate kiss on Kathryn before he boards the train. Of course, little does he realize, Kathryn is also coming along on the journey but she plays along under the pretense that she can't bear to part with her new man. Inevitably, this results in a great scene where Gene Kelly tells her off, only to realize his superior-- the colonel-- is not only her father but on the other side of the door. Predictably, Eddy avoids Kathryn at all costs as she works hard to amuse the troops on the base but when he decides he'd like a promotion and a different spot in the military, he decides to try and sweet talk his way into it by dating Kathryn. Naturally the set-up turns into love much to the dismay of Kathryn's father and-- facing the prejudice of a lowly soldier without rank possibly not being deemed good enough to marry the daughter of an officer-- the film's boy meets girl/loses girl loop begins to mostly charming effect that's bolstered by the high energy of its stars. Nominated for three Oscars including its gorgeous cinematography-- while Thousands Cheer is structurally uneven since it uses a traditional narrative structure for a large portion of the movie before suddenly launching into an elaborate stage show that disappoints viewer's investment in the characters, it's easily forgiven since nobody dazzles quite like the talent roster of MGM. Featuring Eleanor Powell in a tremendous tap number, a beautiful rendition of “Honeysuckle Rose” by Lena Horne, our emcee Mickey Rooney, and a fun early “rock” track with Iturbi and Judy Garland performing the “Joint is Really Jumpin' Down at Carnegie Hall,” Thousands Cheer also adds in fun turns by Lucille Ball and Red Skelton that provides the ultimately distraction to the film's sudden decision to derail the plot in lieu of spectacle. However, while the lineup alone is worth it and those who can't get enough of That's Entertainment styled compilations will probably want to skip right to the final production numbers-- to Gene Kelly fans, the must-rewind standout of the picture is when he earned his first opportunity to provide his own choreography for a now-famous routine wherein he performs a romantic dance with a mop standing in for Grayson. Catching a glimpse of the style of masculine and athletic movement that would become his signature along with the enviable way he utilizes everyday objects that he would perfect over the next decade-- it's therefore no wonder that George Sidney worked with him again in Anchors Aweigh a few years later. However, as an investor who'd assisted bankrolling the start-up of William Hanna and Joseph Barbera's company Hanna-Barbera (The Flintstones, The Jetsons, Tom and Jerry), by the time Aweigh came around, they were able to trade up from the mop to Jerry the Mouse with the wonderfully inventive live action/cartoon dance that's still influential to this day. One of the many, many titles now available both online digitally as well as in DVD format as Warner Brothers begins opening up their historical archives to present forgotten classics-- Thousands Cheer is a must for Kelly enthusiasts, a curious film to foreshadow the eventual musical growth of director Sidney, and a reminder of not just the queen of tap in Eleanor Powell, but one that also reveals once again just how incredibly lovely Kathryn Grayson's voice sounds on film. While my sole complaint (aside from nary an extra when there's some fascinating research to be found including the fact that the writers of this pro-America picture were blacklisted in the '50s!) is the lack of a menu to enable you to jump to a direct scene. Since in its place we're instructed to use our remote to move forward ten minute segments, therefore making it hard to find the scenes like Kelly's you cherish so you may want to get your pens ready or try to make a bookmark to work around the absence of the menu for future viewings.